Be There – The Challenges Of Getting Out To Shoot. We all know the aphorism “f8 and Be There”, it’s the basic mantra of landscape photography. 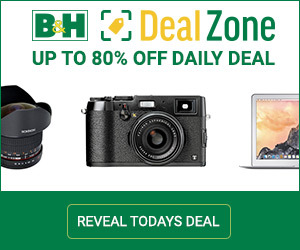 Here on LuLa, we’re familiar with the “f8” part, that’s just photography. But it’s the other part, the “be there” part that’s more difficult. MUCH more difficult. But where and when is “there”, anyway? Usually, it’s somewhere photogenic at the edges of the day. “Magic Hour” we call it – a misnomer, for it lasts just a few minutes when the sun is close to the horizon. Those fleeting moments near sunset and sunrise are a treasure for landscape shooters and we’ll do whatever it takes to be somewhere interesting and beautiful at magic hour. Let’s say you want to shoot the sunrise. 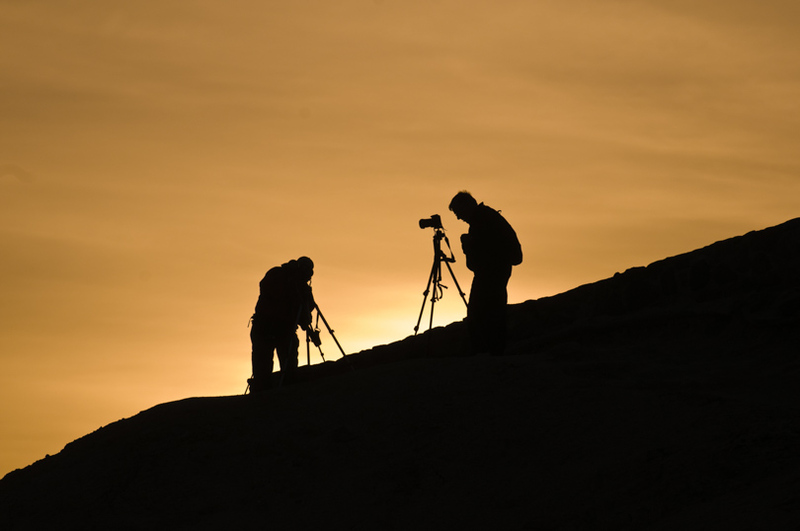 You need to be on location and ready to shoot well before dawn. If you stay in motels, that means that you need to set your alarm for very early indeed, for it’s often a long drive to the location. 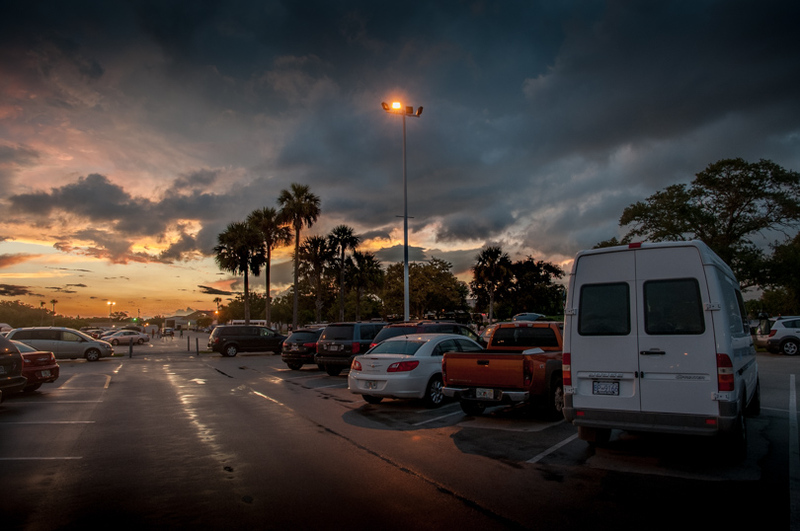 At the other end of the day after shooting the sunset, you’ll probably find yourself facing a long drive home in the dark, arriving back at the motel long after the restaurants have closed. As my friend, Ben would say, “That’s sub-optimal”. Being there at the right time. A van like this often lets me sleep on site. When my alarm goes off, it’s just in time for sunrise. I pull the curtain aside and if it looks promising, I’m out the door. If the sky looks uninteresting, I’ll just roll over and go back to sleep. And, of course, Frito is the restaurant, too. If I need to wait for better light or for the clouds to move, I can make coffee. In fact, I can make breakfast. Here, just outside Canyonlands National Park, I have this desert all to myself. With a full moon and an LED flashlight, I entertain myself for hours photographing, reading, or simply sitting, sipping a cold beer and enjoying the solitude of the evening. At this spot on the California Coast, there were no signs prohibiting camping. So I did. It was an hour’s drive to the nearest town and, like in Canyonlands, I had the landscape, in this case, the Pacific Ocean, all to myself. All night. Both sunrise and sunset. That’s two magic hours. The vehicle that makes this all possible looks like this. This is a 2004 Mercedes Benz T1A Sprinter, a parcel delivery van. Up front is a 2.7 litre, five-cylinder turbodiesel that will take me over a thousand kilometers on a tank of fuel; handy in the wide open spaces. The cargo area offers stand-up headroom for six-footers, and if you’ve ever got dressed on a cold morning in an SUV, you’ll understand the value of that. Priceless. Especially if you’re old, like me. Sleeping crosswise is a non-starter if you’re over about five and a half feet tall, so my bunk runs lengthwise behind the driver’s seat. This bed layout is called a “gaucho” and there I can stretch my six-foot self right out for a perfect sleep. I even have my own pillow. Jon on the Arizona trip. 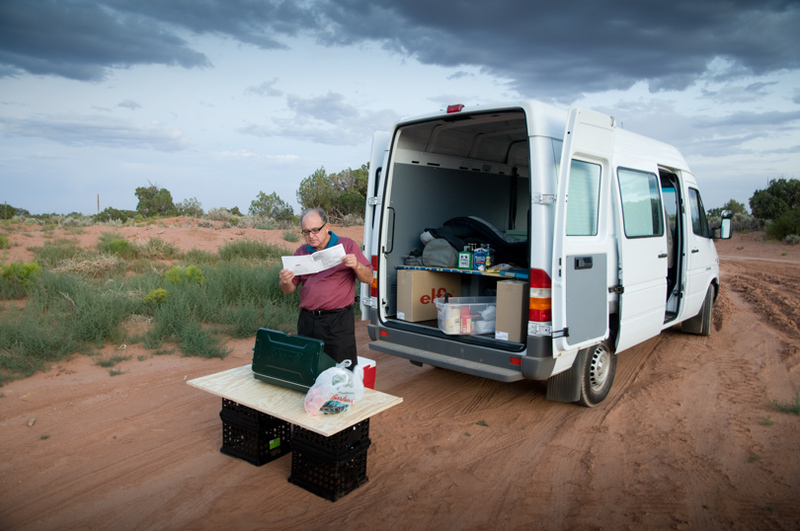 Here, on my first camping trip on the way home from Arizona, my pal Jon studies the instructions for the propane stove. Inside the rear, where those two cardboard boxes are, I now store 120 litres of water, the kitchen and garden furniture, most of the perishable food and an Engel fridge/freezer. I lived for years with soggy lettuce and a plastic cooler full of expensive ice. Never again. The compressor-driven Engel means that I can make my own ice. Imagine, if you will, the desert evening margaritas. We’re photographers, right? We like to see stuff. 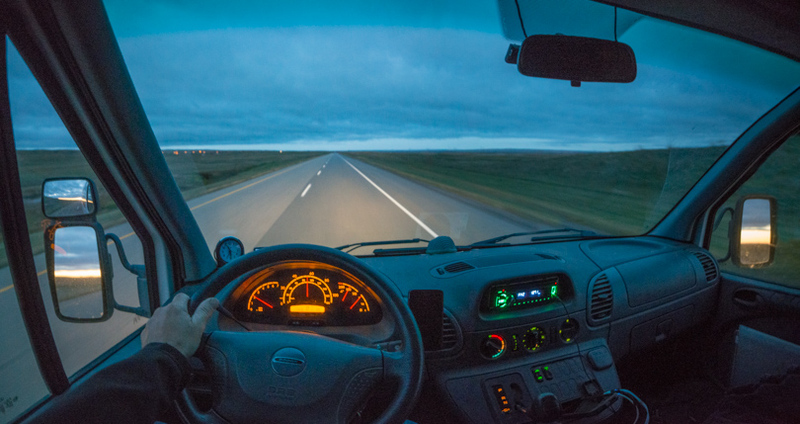 The driver’s seat height in a Sprinter is higher than nearly everything else on the road and the view through that huge windshield is spectacular. You can see everything. Think about that. 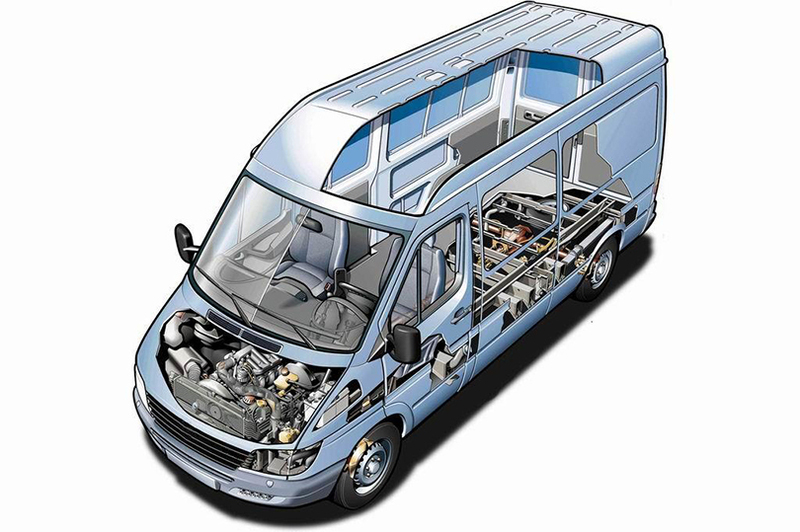 The Sprinter first appeared in North America in 2002 and since then, several other similar vehicles have arrived that offer similar advantages. 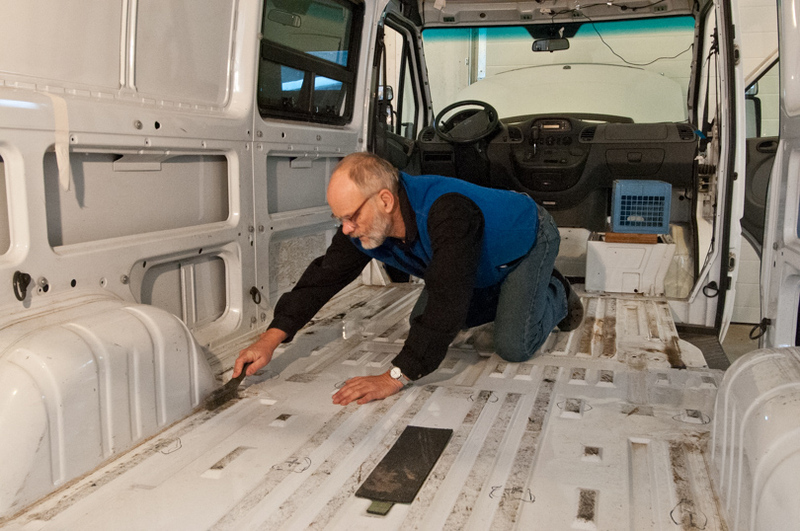 Ford’s full-size Transit van uses the American standard F-150 driveline and should avoid some of the quirky and sometimes expensive maintenance issues common to Mercedes Benz. Chrysler also imports the Fiat Ducato, re-badged as a Pro Master. Both offer similar interior space and many of Frito’s capabilities, but none can equal his long legs and excellent fuel economy. Frito’s fuel costs are about two thirds those of my Honda pickup. Not bad, for a house – one that will park in a standard parking space. Frito had just 9800 miles on the clock when I met him in Mesa, Arizona in 2008. I signed a check that day for the low $20’s and drove away. Ten years later a new one will run easily into fifty grand, just for the bare van. The total budget for Frito including the upfit would probably total close to $30K, not including my labour. 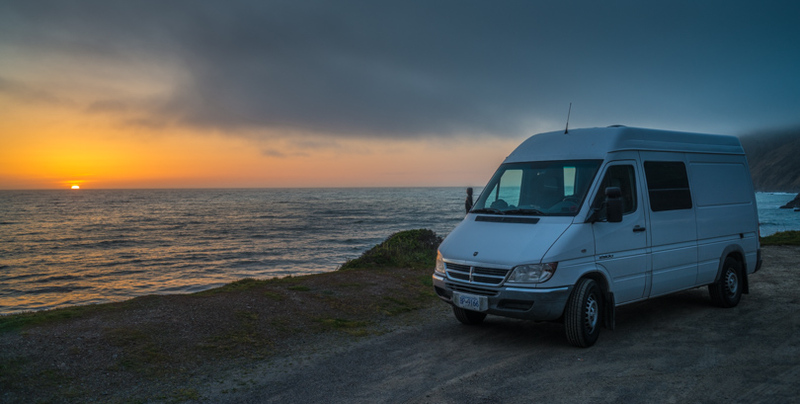 A well-equipped RV on a similar chassis costs well over a hundred thousand dollars. But then, you’re traveling in an RV, not a white van. More on that later. My build philosophy was “the simpler the better”. That means there’s less stuff to go wrong and more money left over for fuel. Having completed the equivalent of five times around the world in Frito so far, fuel is a significant budget item. The empty vehicle is basically a big tin drum. The road noise, especially in the rain, was intolerable so soundproofing was job one. I used a combination of noise abatement techniques, most of them involving mass. I lined the floor with one-inch-thick recycled rubber horse stall mats that were so heavy I had to use my tractor to move them. I insulated the walls and ceiling with mass loaded vinyl noise reduction material, residential glass wool and a vapour barrier. 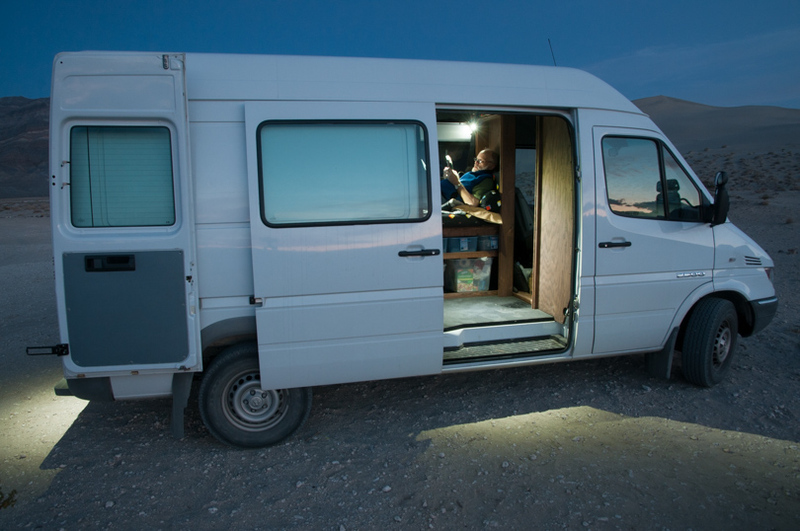 Overhead LED spotlights, the fridge, a small 110VAC inverter and a USB charging panel all run from an auxiliary battery charged by the vehicle’s alternator. Solar is on the to-do list, but so far in average temperatures, I can stay in one spot for nearly a week without charging the battery. A foldable porta pottie and a pee bottle take care of basic needs. Showers are a luxury and I take advantage of truck stops when I can. Otherwise, it’s sponge baths and submariner showers. I carry enough water for weeks on the road, but it’s still a valuable resource. Under my bunk, on the top layer is where my propane stove travels, flanked by a long pole for my windshield squeegee, sometimes reverting to camera support. The upper row of 6 small storage containers keeps small things organized, as does the bottom row of four larger containers. They’re all captive when underway, yet easy to pull out when needed. A secondary storage system opposite the bed houses three easily removed milk crates. Commonly used kitchen tools are right inside the door on the left. 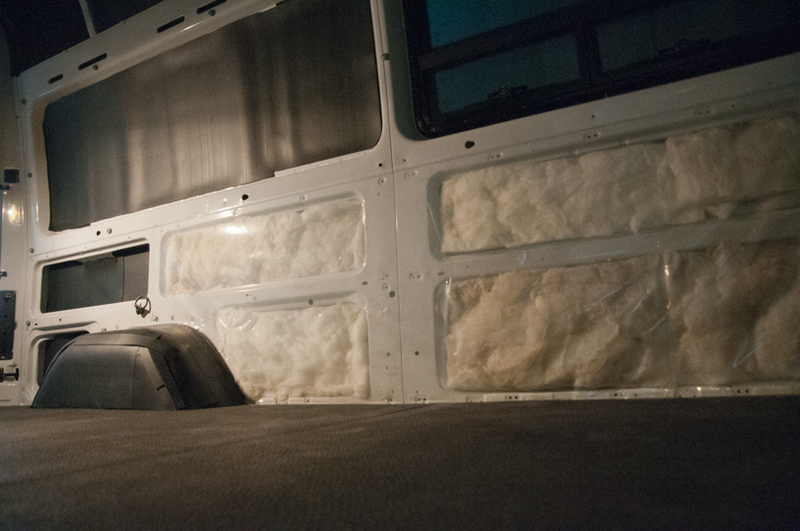 Clothing hangs on the walls and everything aft of the cab is constrained by a ¾” plywood bulkhead. The entire interior can be removed in an hour if I need to move, say, an Epson 9800. Which I did. Hanging out in the van. 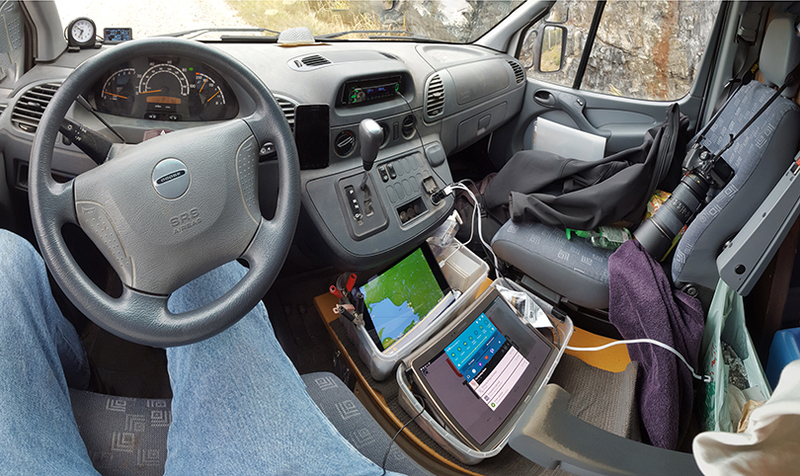 The dashboard in the van. On the dashboard at extreme left is my rate/time/distance clock and an OBD engine parameters monitor. Between the seats in the plastic boxes are two tablets and their associated USB cable clutter. One tablet runs the entertainment and, the other mapping, presently showing my position on the east shore of Lake Superior. On the passenger seat headrest hangs one of my two D800s and nearby, my jacket and a purple towel to cover all that stuff up when I’m out of the vehicle. In addition to the stove and fridge, a table and a pair of sturdy lawn chairs complete the essential furniture list. Even though I usually travel alone, that second chair has won me many a friend on the road. A van allows you to dawdle in comfort. Here, in Amboy, California I had the intuition that the weather might provide a good sunset, so I decided to just wait it out. I spent most of the afternoon reading, surfing the Internet, snacking, and practicing my fingerpicking. I even had time for a snooze. Turned out, I was right. At sunset, Mother Nature provided a magical gift beloved by landscape photographers everywhere: lenticular clouds. Here’s the view that evening, looking east. This pano is 15k pixels wide. And looking west, this was my other reward. Not quite as interesting, but still worth waiting for. The nearest hotel was at least an hour away, either in Twenty-nine Palms or Vegas. I simply crawled into bed went to sleep. In Florida to watch one of the last Shuttle launches, I camped here for two nights, waiting for NASA. This shopping center had a gourmet food market, two cocktail bars and a cineplex, so I was all set here in the parking lot. That’s one of the best things about Frito. He’s invisible. Nobody cares. 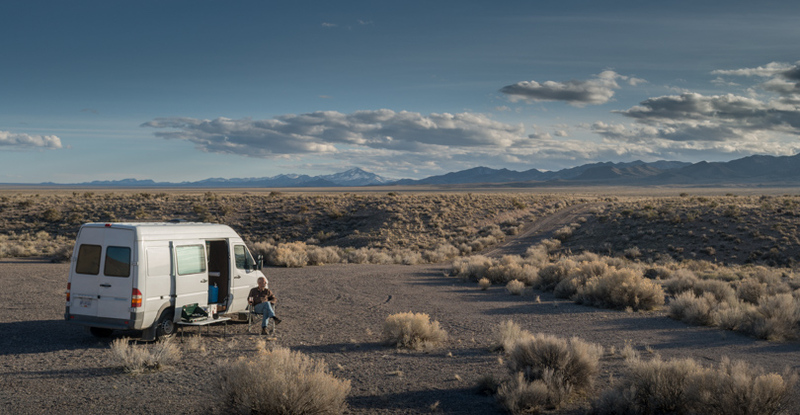 I’ve parked in some amazing urban locations, sites that would be a magnet for the authorities were I driving an RV. But because he’s invisible, I’m immune to hassles. In hundreds of overnights I’ve been awakened and questioned just once: in a small town in Pennsylvania in a campsite signed “Dry Cleaners”. When they learned my story (I was on the way home from the Shuttle launch) the cops said “Be gone by dawn”, and I was. And that’s been my urban-camping watchword ever since. A stealthy camper is invaluable. 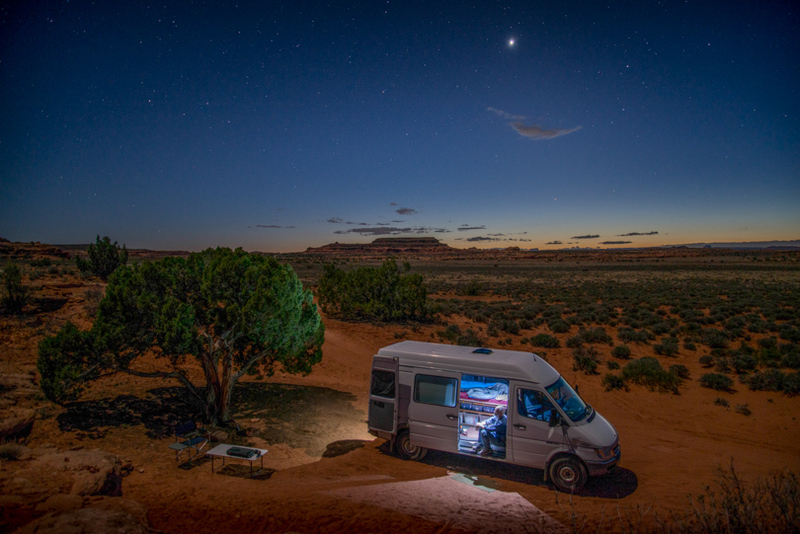 Off road in the van. Offroad, the Sprinter does very well. I carry recovery tools, but I’ve never been stuck. There’s a 4X4 version, but that kind of performance is seldom necessary. High clearance RWD with traction control does me just fine, even here in Death Valley, where the term “rough road” really means something. 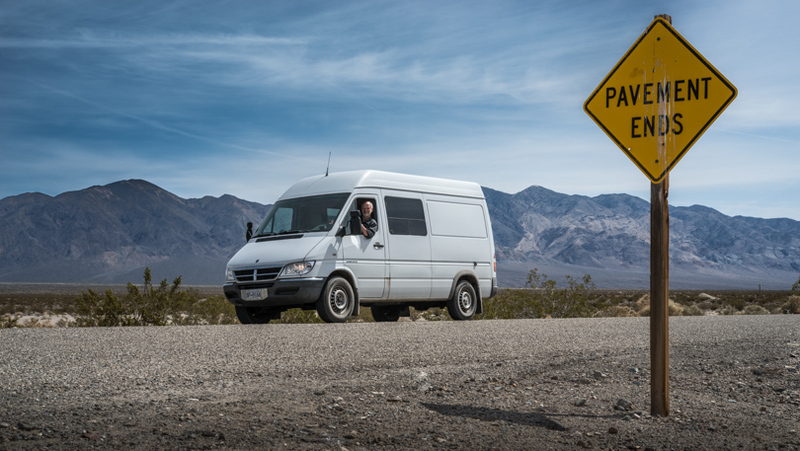 Designed to navigate narrow European streets, the Sprinter is incredibly agile. Couple that with the excellent visibility and narrow track, if you do get stuck, it’s your fault. 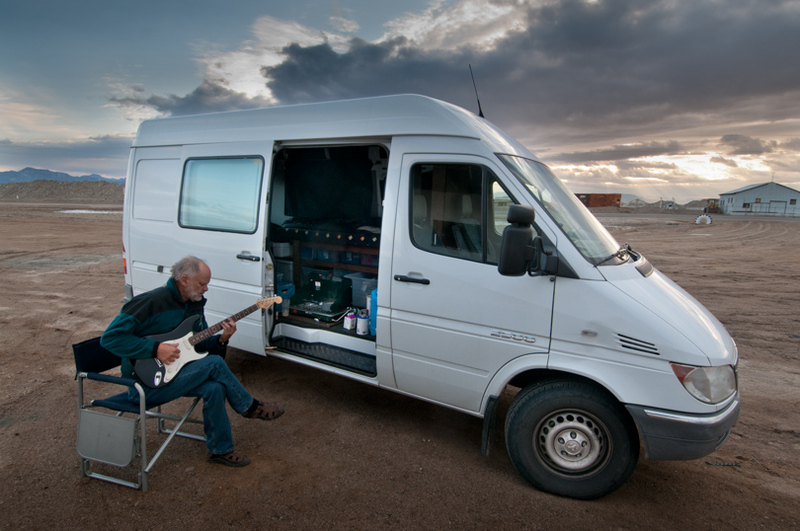 As a road trip vehicle, a Sprinter is pretty hard to beat. Motorcyclists (me among them) often speak of the freedom of the open road. But bikers still need motels and restaurants. I don’t. They need to be somewhere at sunset, preferably somewhere comfy, safe, and inexpensive. I don’t need to go anywhere for any of that, it’s always with me. At sunset (or sunrise) I can be pretty well wherever I want, for free. And for a landscape photographer, that’s perfect. 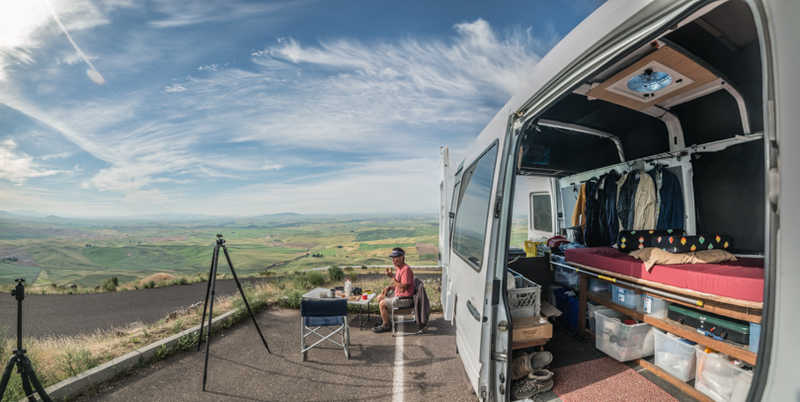 For more on Frito in particular and Sprinter van camping and landscape photography in general, please visit my site here. 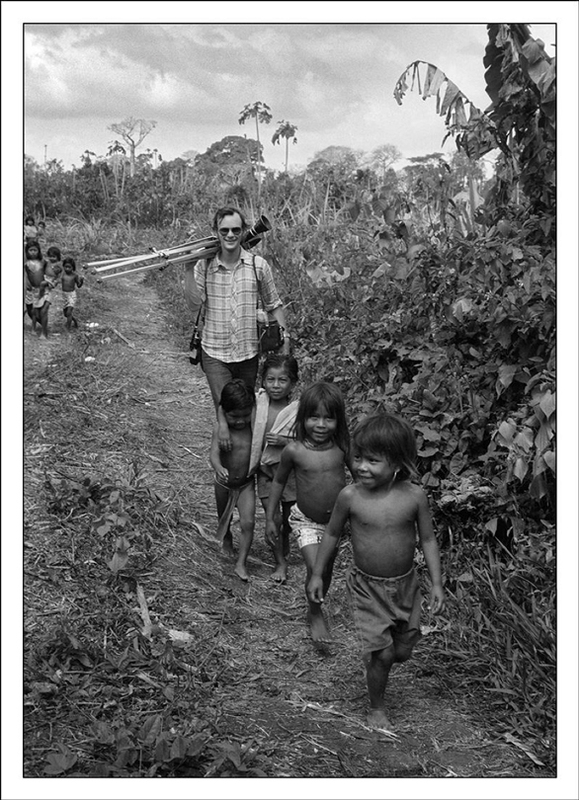 Peter McLennan is a director/cameraman, formerly based in Vancouver. He spent several decades shooting projects ranging from car dealer commercials to Hollywood movies. His career took him to over fifty countries. Retired, he now lives in the Kootenays district of southeastern British Columbia.